My name is David Lee Finkle, and I draw Mr. Fitz. I use my middle name, because there are other David Finkles out there. One writes books on being organized and tidy (something I would never write about), another is a theater critic (something that might be fun, if I lived in the right city), and yet another used to write for Pinky and the Brain (again, fun, but Pinky and the Brain is off the air now). At any rate, I was born in Saratoga Springs, New York, and grew up in Round Lake, New York. My first cartoon was a crayon drawing I did for Fire Safety Week in Kindergarten. We were supposed to draw a picture of what to do if the school is on fire. 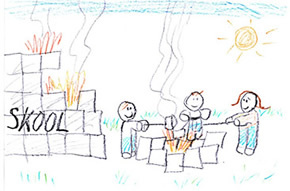 I drew the kids roasting marshmallows over the smoldering embers of the school. It was, I suppose, my first satirical educational cartoon. I have always loved comic strips, and I learned to read so I could read the funnies on my own without having to beg someone to read them for me. 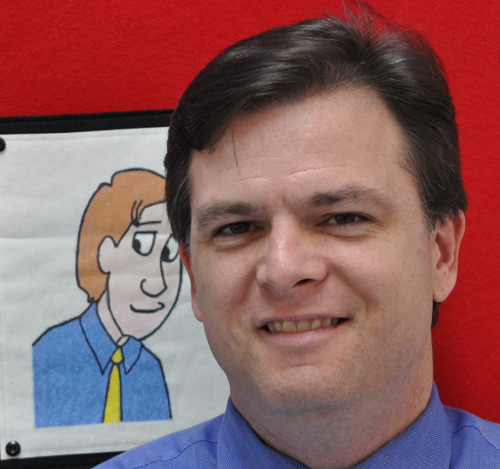 That love of reading comic strips blossomed into a love of reading just about anything else, and that grew into a love of writing, and, of course, drawing comic strips. My first was about a dog inexplicably named Poochey. I drew a comic strip for my home town newspaper, The Round Lake Journal (it was actually more a newsletter, but it was still cool to be in print). When I came south for college at Stetson University in DeLand, Florida, I kept on writing and drawing. For the Stetson Reporter I did two comic strips: The Mod Hatter and The Forest of Arden. After graduating Stetson, I went north for a year to student-teach through Russell Sage College in Schenectady, New York. During spring break of that experience, I got engaged to my college girlfriend, Andrea Liska, and after finishing my semester at Russell Sage, I came back to Florida and landed my first teaching job in 1990. 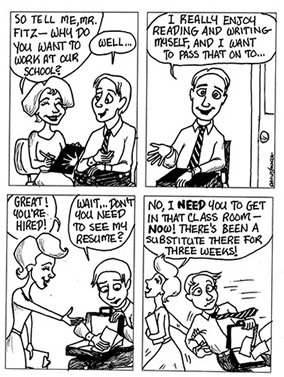 After moving to Southwestern Middle School in DeLand in 1999, I began to actually develop my sketches into a comic strip called Mr. Fitz (from my mom’s maiden name, FitzGerald). I offered it to the Daytona Beach News-Journal, who initially said they had no space for it, and that it wasn't all that funny. 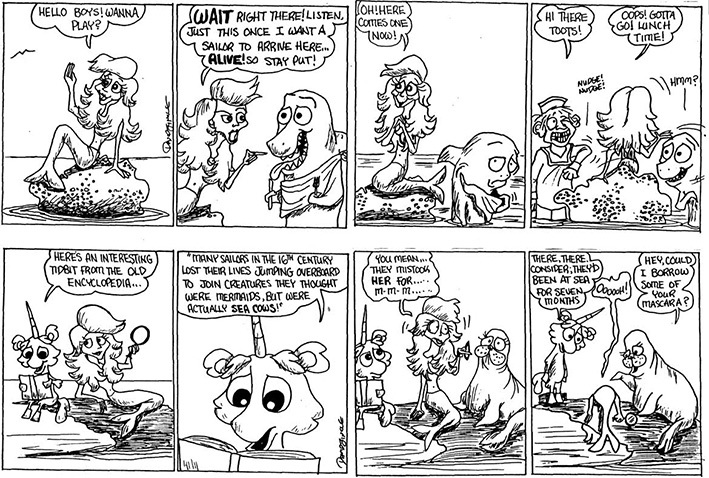 But in March of 2000, the same week I had my first novel, Making Escape accepted for publication, the News-Journal called to tell at school, during my cartooning club no less, to tell me that another comic strip, Eek and Meek was ending its run in newspapers, thus creating a space for mine. They asked if I could start the following week. I said yes, and Mr. Fitz started its newspaper run and has been running in the News-Journal ever since. My life-long dream to have a daily comic strip in a real newspaper had a last come true. I was not syndicated yet (and still am not-- the syndicates have turned me down 4 or 5 times), so fame and fortune on a vast scale have never followed, but I began building an online presence and Mr. Fitz has now been featured on the cover of the Nation Council of Teachers of English magazine, Voices from the Middle, in two books for teachers I’ve written for Scholastic (Writing Extraordinary Essays and Teaching Students to Make Writing Visual and Vivid), in the Scholastic book Open a World of Possible, and on the Washington Post’s education blog, The Answer Sheet by Valerie Strauss. Shortly after the strip launched, our then 4 and 5 year old children, Christopher and Alexandra pointed out that if I was Mr. Fitz, and my wife was Mrs. Fitz… where were they? Mrs. Fitz became pregnant with twins (and fueled rumors that Andrea and I were actually expecting twins) and our kids got to name their own characters: Tom and Jen. Thanks in part to the strip, I won Teacher of the Year for my district, Volusia County Schools, in 2004 (but I was officially the 2005 Teacher of the Year; don’t ask: It’s complicated). Probably also due to the strip and its very vocal criticism of Florida’s testing program, the FCAT, I was not even considered as a state finalist. I am still in the classroom, teaching 6 periods a day, some gifted students, but mostly just “regular” classes (whatever that means). My wife taught at my school with me for eight years, but has now moved on to teach at the high school, but not to get away from me, so far as I know. I also teach gifted students at Stetson University’s HATS program. Each summer I teach a week of cartooning and animation, and a week of fiction writing where we produce a novel in three days each year! Our children did indeed come through my classroom, though two years apart. As I said, they aren’t twins in real life. Our son is a Math major at Stetson University, and in the summers, he teaches with me at Stetson’s HATS program for Gifted students. We have also written two YA novels together. Our daughter, who paints, writes poetry, and could probably go into standup comedy, is currently attending Daytona State College.. I don’t make much on the strip, but spend quite a bit to produce it. If you’d like to support what I do, feel free to make monthly contribution on Patreon.